Why Theology at a University? 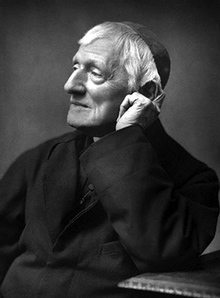 The recently beatified John Henry Cardinal Newman, 1801-1889, is considered by many to be the most important Catholic thinker of the modern period and a pioneer in Christian Personalism. His insights on conscience, the individuality of the person, on reasoning, friendship, the dignity of the laity, and so on, anticipated and paved the way for the developments of 20th century Catholic thought. This course is an introduction to his life, writings, and major themes. If you would like to dive into the subject right away, I highly recommend Ian Kerr's John Henry Newman: A Biography. It is a large book, but very well written, often using Newman's own words, and it discusses Newman's thought as well as his history. Newman's sermons are another excellent place to start. O'Connel has a good selection here, and Copeland has one here.